Do a Pinterest search for “Montessori at home” and one thing you’re likely to see repeated in nearly all of the images are shelves. Open access shelving is beloved by Montessorians everywhere because it facilitates some key in the young child’s life like freedom of choice (the options are on view), independence (everything can be easily reached, even by the youngest child), and a sense of order (everything has its place on the shelf). It’s also a way to limit options and avoid overwhelming a child with too much stimulus — fewer items can be displayed brightly on a shelf than can be jammed into a toybox. Up till this point, Sage has been pretty happy to look at mobiles, look out the big glass doors, or to engage with simple materials handed to her where she was. When Sage started to really move earlier this month, she made it clear that she was ready to access shelves. Jasper graciously gave up a lower shelf in the main hangout room in our home, and she’s given up reaching for his beloved farm animals. Win-win. When choosing materials, at any age, I always try to understand what the child’s body and mind are working on right now. (Editorial aside: these things really are a need! Children come with an amazing inner drive to work at their current developmental stage. Have you ever tried to fly on an airplane with a baby who’s just learned to walk or crawl?) From about six months on, the baby is really beginning to notice the world beyond mama; she needs to move and to explore. This week, at very nearly 7 months, I have a few simple things on view, on a floor level shelf below the one where we keep our nature treasures (pictured above). Currently these are the bottom level of a larger set of shelves that also holds materials for grown ups — records and books and our stereo system. Sage’s shelf is a beacon that draws her in and encourages her to move towards it. The wooden spoons are safe, fun and interesting to explore. My husband is a musician, and music-making is a daily part of our family life. Across the same room are two shelves of kid-friendly, accessible instruments, mostly percussion. The spoons are Sage’s intro to playing with sound. The knit ball rolls slowly when she drops it, and it becomes a slow-motion chase around the room. 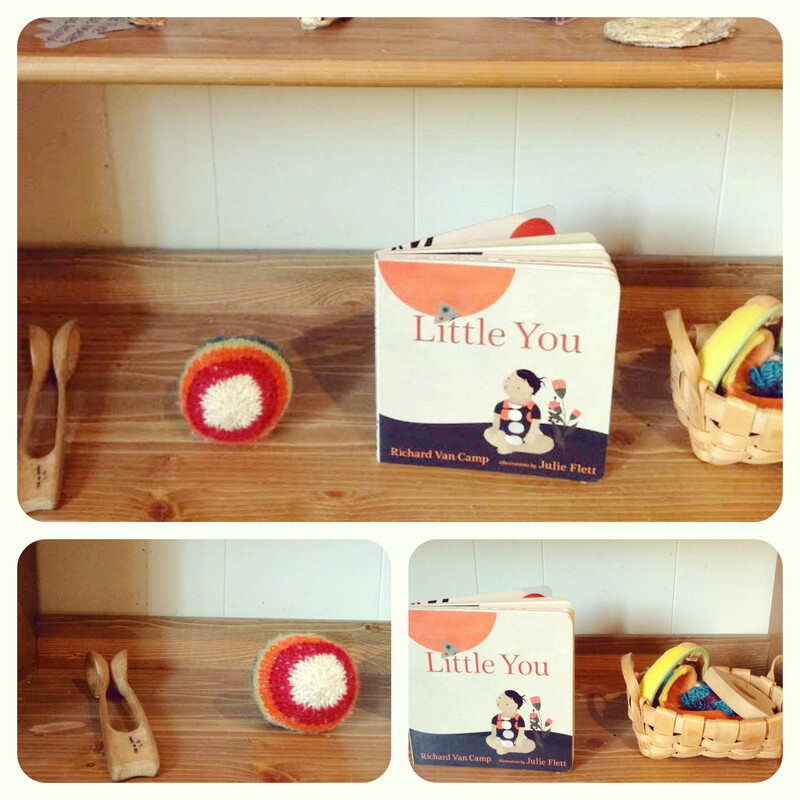 “Little You,” by Richard Van Camp, and illustrated by Julie Flett (Canadians! ), is a beautiful book with great images. Sage can manipulate the board book pages or we can look through it and read it together. The text is peaceful and loving, and a balm for a weary mama. The little basket is one of my favourites. Six inches long, with two tiny handles at the edges, it’s the perfect first “tray” for a baby. It’s being used as an exploration or treasure basket, filled with interesting things to look at, grasp, and move. A mirrored ring, a long reflective ribbon, a wooden teething heart. For more on baby shelves, check out this post from Montessori Mischief, and this one from Nduoma which celebrates one of the best gross motor development materials. What’s on your shelves these days (no matter your childs age)? Get this: not only do I find myself loving cloth diapers, I am loving changing diapers. And no, I don’t think I’m any crazier than your average mom of an infant and a toddler (which, okay…). Cloth diapers have a whole lot of good going for them: they’re a more environmentally-friendly waste-solution, they don’t mask wetness and they are associated with more effective toilet learning. But lots of people have cloth diaper fears that mainly boil down to this: it’s too much icky work. I figured out pretty quickly that it’s not actually that much extra effort — diaper changes are just as quick, and people with kids do lots of laundry anyway. No problem. Flashback two years, however, and you’d find me avoiding the cloth diapers piling up in a corner of my baby’s room, lonely and unused. I wanted to use them, I’d make efforts to use them, and somehow I’d find myself buying, using and throwing out disposable diapers. I felt overwhelmed. We’d moved shortly after Jasper was born and were still in the process of setting up a home. I tried keeping diaper supplies on both floors of the house, and eventually settled on a changing him on the floor of his bedroom, a location that didn’t work for either my husband or my mom (and therefore, didn’t work). It all just seemed like a lot to manage, one more thing to worry about. Where are the covers? Where are the clean diapers? Why are there so many clean diapers piling up? Do we have wipes? Where are the wipes? Does the diaper pail stink? And on, and on. The pack of Pampers seemed like an easy way out. This time around, I promised myself it would be different. And it has been. Changing diapers has an element of fun to it — choosing a colour, fastening the snaps (weak, I know, but I promise, there is not even that much joy in disposables). It’s a time to spend making eye-contact with my babe, talk through what we’re doing and giving her my full attention. So what’s the difference? Ladies and gentlemen, prepare yourselves for the wonders of the prepared environment. I got it together by getting a changing station together. Absurdly simple, but amazingly effective. It’s got it all: a soft place for baby girl, a stack of clean diapers & a basket of covers, and another basket holding diaper liners, wipes and cream. And we really use it. It’s the only place in the home that we change Sage’s diaper, and the environment there is becoming a signal to her, so that she knows what to expect. I have no questions, and neither does she. We’re loving it. 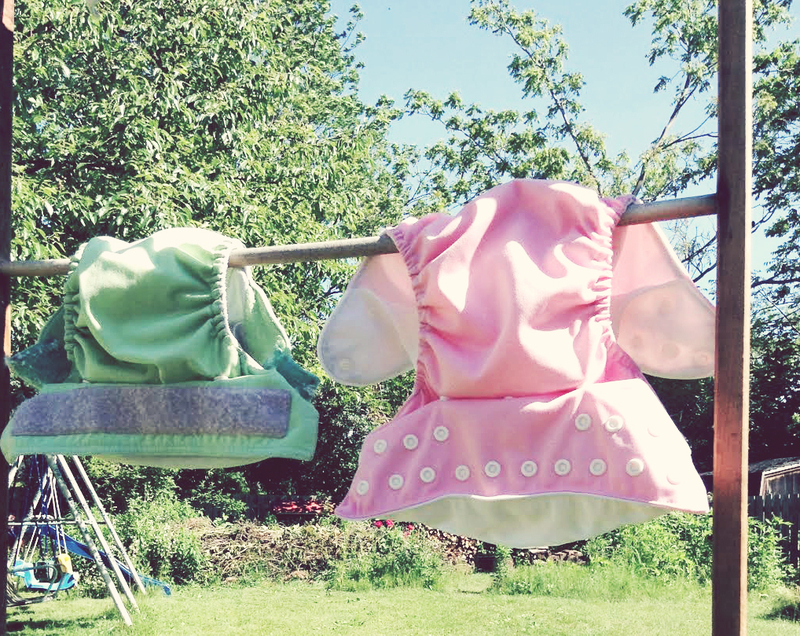 For more on the joy of diaper changes, check out this great post from Janet Lansbury.